In today’s era, this age is of applications. Mobile users are overgrowing and like to access everything on their mobile devices. A mobile app can benefit you because you can deliver services to your customers wherever they want. Building a mobile application is not an easy task as it sounds. You need proper strategies, marketing perception, UI/UX knowledge, and enough knowledge of various native mobile OS and cross-platform software’s which consist of the modern mobile landscape. You have whole application idea, but don’t have the dexterity for application development, or possibly you do not know anything about code/programming but still want to implement your approach. For the implementation of your idea in real life, you will need to hire mobile app developer or mobile application development Company, but there are few things to look before hiring the right mobile app developer. 1. Analysis the platform for your application: It is essential to finalize that for which platform you want an application. Many developers and companies say that they can develop for many platforms and even they will try to force you to build app for multiplatform. If you have clear vision and analysis of your app platform, then you need to stick to your views. If your target audiences are Android users then focus only on Android platform, don’t distract from developers and ruin your idea. Nowadays cross-platform applications are getting favorite, but for the best user experience of the app, you need a native application. 2. Understands Your Project: The most critical step in your app development is to avoid failure of the idea and sinking your money. You need to make sure that the app development company or any freelance developer does understand your project very well with all the functionalities along with their module. As a better option, you can make a document for all the requirements you want in your application and share with your desired company or freelancer; and also ask them to make the feature list with keeping your needs in mind. 3. Interview with Developer: When everything is set, you should take decision for the developers who are going to work on your application and ask them whatever questions you have about app development for example: how long they have been developing the mobile apps?, How many apps they have worked on?, or any other relevant question to your project which could build your confidence on developers. 4. Be aware of Unreliable Developers: Some developers are beginners but claim to be an expert; they are unreliable can leave you in middle of your project and will disappear without any trace. Best way to stay away from this situation is, always hire a reputed or established mobile application development company and you should always set milestones for the project and release amount only when the particular sign completed. 5. Ask for Portfolio: You should ask for their previously developed application portfolio, and they will surely share their best work with you except they signed a non-disclosure agreement (NDA). By seeing the portfolios, you can admeasure their skills and capabilities that they are fit for your application development. 6. Which Platform are they going to use? Before assigning the project, Ensure that which platform they are going to use for your application development and why do they recommend that platform? 7. API integration: You should ask that they are flexible to integrate API’s for extra and better functionalities; and also ask for any recommendation of any API which can be useful and you can suggest them as well. 8. Documentation & Maintenance: Documentation is major and important part throughout the development process and even after deployment. Ask them and make sure that how long maintenance they are going to provide and if time expires what will be charged for maintenance subscriptions. 9. Time & Cost Estimation: The last but not the least. Request them for the time and cost estimation for your application development. You should remember that great application with perfect functionality takes time so never hustle up. Do not let price drive you, never select a development agency or freelancer based on price quote because you are going to deliver the great application with amazing functionalities, not the cheap one. 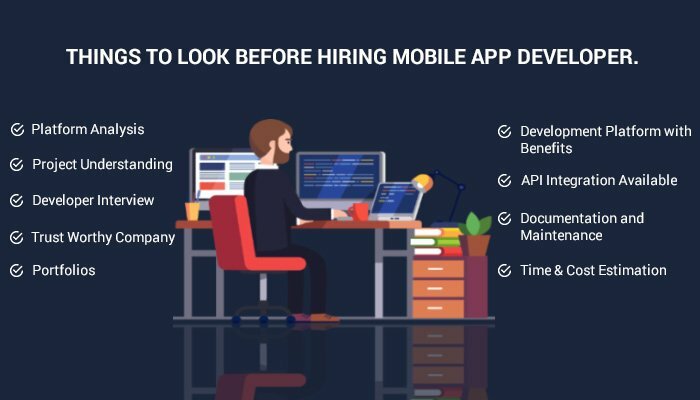 Conclusion: If you have read this article step by step then surely you will save your time and money when you will hire mobile app Development Company or dedicated developer.